Nissan Altima transmission issues will continue to be argued in a Massachusetts courtroom. January 21, 2019 — Nissan Altima transmission issues will continue to be argued in court as a Massachusetts judge denied to dismiss the lawsuit that alleges the continuously variable transmissions (CVTs) fail prematurely. Nissan filed a motion to dismiss the class-action lawsuit, but U.S. District Court Judge Leo T. Sorokin ruled Nissan's motion was "meritless." The Nissan Altima transmission class-action lawsuit includes all Massachusetts consumers who purchased or leased 2013-2014 Nissan Altimas. However, Costa argues the Altima would start shaking out of no where and the CVT finally failed in June 2018. According to the lawsuit, the plaintiff had to pay $3,500 to have the transmission replaced, a problem Costa says occurs often to Altima drivers. The 2013-2014 cars allegedly hesitate, shudder, make noise, stall and eventually suffer transmission failures due to defects in the CVTs. The plaintiff claims the transmission issues cause a serious safety risk that has been concealed by Nissan as the automaker throws the repair costs onto customers. In its motion to dismiss the lawsuit, Nissan claims the plaintiff described vague symptoms allegedly caused by the CVTs but allegedly didn't point to any specific defect in design, workmanship or materials. The judge found the plaintiff did assert the alleged transmission issues caused complete failure of the CVT that required her to pay thousands of dollars to replace. The judge also ruled the plaintiff clearly identified promotional messages from Nissan which are allegedly deceptive based on the workings of her transmission. In other words, at this stage of the pleading Costa did enough to sustain her claims. However, the judge ruled Costa didn't simply allege the CVT wore out faster than expected but rather described the safety-related issues such as unexpected surges of power and a loss of motion. The Nissan Altima lawsuit was filed in the U.S. District Court for the District of Massachusetts - Krista Costa, et al., v. Nissan North America, Inc. The plaintiff is represented by the Pastor Law Office, Barnow and Associates, and Blood Hurst & O'Reardon. 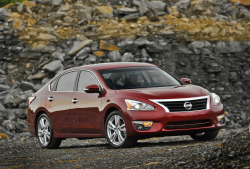 CarComplaints.com has complaints about transmission issues in 2013 Nissan Altimas and 2014 Nissan Altimas.